and you on your bicycle, if you're lucky. Today I had a long ride ahead of me, made longer by my last minute decision to climb Passo di Gavia from Ponte di Legno. After all, I thought, the road up the pass’s southern side is its signature route, and by far the most difficult. Sometimes, you define yourself not by the things you do, but rather the things you don’t. It’s quite an annoying trait really but the thought of missed opportunity – even in relation to overseas cycling climbs – can lead to an expensive case of unfinished business. Besides, spectacular passes such as Stelvio, and as recently as yesterday, Mortirolo, had already left a lasting impression on both of us. Like the kid who desperately wants two flavours of ice-cream, only to receive one, I wouldn’t be satisfied without a second taste. not one hint of a motorcyclist, thank god! ﻿Even in good weather, Gavia is no pushover. Averaging 7.9% over 17 kilometres, I compared it to riding Arthurs Seat (my favourite ‘hill’ back home) six times, but without the three-kilometre downhill between each climb. (A word of warning however; if you’re ever down on Melbourne’s Mornington Peninsula, don’t underestimate Arthurs’ 8.1% average gradient. 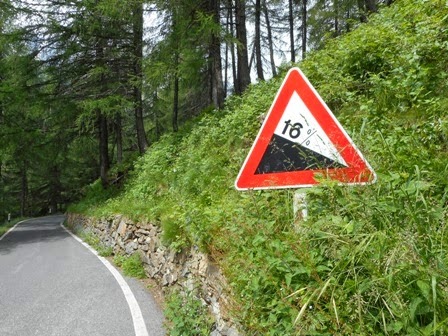 It can be quite unpleasant, especially by the sixth climb). Offering an unexpectedly comfortable beginning, the SS30 road gradually follows a small stream, the Frigidolfo, uphill for a few kilometres. Save for two short sections around 6.5%, the remainder of the ride up to the top of the pass (which is approximately 13 kilometres), is like climbing stairs. Having no more rear cogs to call upon, I was off my seat more than on it. The road, now not much wider than a single lane, I had to constantly look out for cars or groups of motorcyclists coming the other way. Noticing a jogger 30 or so metres out in front of me, I momentarily picked up the pace from my mediocre eight, to nine kilometres per hour. He on foot and me on my Bianchi, I naturally assumed that I would quickly pass by before leaving him somewhere in the lower atmosphere. Short of stature and wearing a loose green shirt, I soon learned that his legs were pistons. He was a V8, while I felt like a clapped-out 120Y Datsun on three cylinders. The best I could do was keep pace with him for about a kilometre but as soon as the gradient hit 16%, I was the one left languishing behind. Taking just under two hours to reach the top of the pass, I never saw my wheel-less climbing partner again. Somewhat humiliated and knowing I still had another 150 kilometres left to ride, I wasn’t going to lose any time searching for him either. Approaching the summit of the Passo del Tonale. 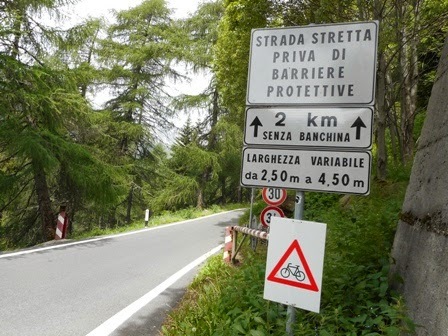 Having travelled down the pass towards Ponte di Legno a few days earlier, I felt more at ease negotiating the narrow winding road with its steep and sharp corners. 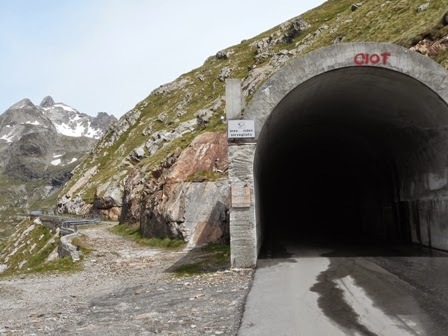 Even the dark sinister tunnel, with its looming threat of motorcyclists didn’t faze me. Soon out the other end; it's amazing how quickly you can ride with a little fear on your side. 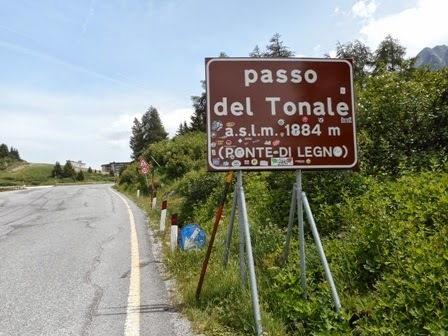 Back down in the valley, I turned left onto the busier SS42 road towards the less menacing Passo del Tonale. Shorter, not as steep and of a much lower altitude than Gavia, it wouldn’t take long before I was having lunch with Roz in one of the many eateries along its vast highway summit.